The Hotel De la Ville , a 3 star family run hotel between the sea and the center of Cattolica, offers guests: equipped garden, outdoor playground area for children, parking and WI-FI throughout the entire hotel. Admits small animals. 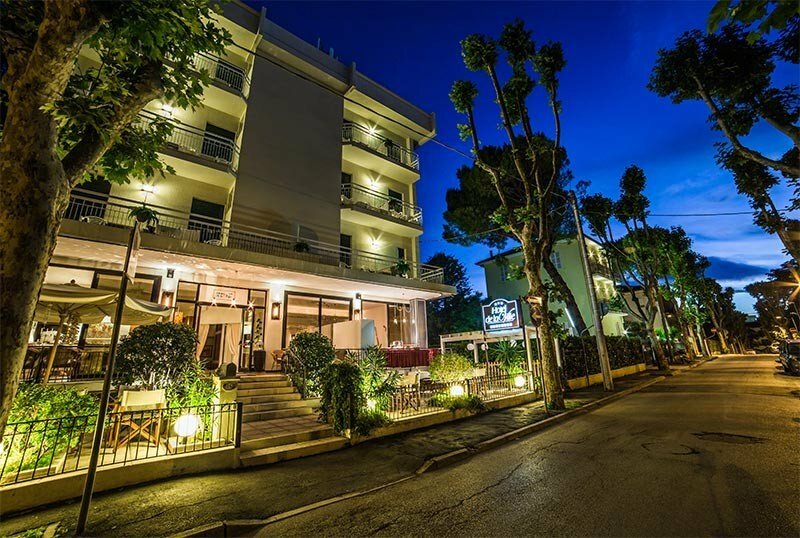 The hotel is located in a quiet area of Cattolica, in a tree-lined street less than 5 minutes walk from the beach. In a few steps you reach the avenues of the promenade and, in the opposite direction, you reach the dock and the square of the port. The rooms are soundproof and have a balcony, air conditioning, ceiling fan, direct dial telephone, satellite TV, WI-FI connection and a recently renovated bathroom with shower, hairdryer and complimentary toiletries. FAMILIES: spacious family and connecting rooms are available. Equipped garden, bicycles available, open-air porch, safe at the lobby, 24 hour reception, bar area, living room with TV, elevator, luggage storage and late check out on request. Finally, the hotel organizes theme nights. PARKING: uncovered and fenced, located 20 m from the hotel. BREAKFAST: buffet with fruit juices, coffee, croissants, biscuits, homemade cakes, bread and cold cuts. LUNCH AND DINNER: the kitchen offers typical dishes of Romagna every day with three choice of buffet menus, with homemade pasta and desserts. OTHER: theme nights such as the Romagnola and marinara are organized, with tasting of recipes and typical products. In hotel: outdoor playground area and bicycles with child seats. At meals: seats at the table, baby food, early meal times, kitchenette available to parents with refrigerator and kitchenette. On the beach: live entertainment, baby / mini club. The structure has an agreement with Tinhare beach n. 20 and Bagno Lele n. 8. The establishments, in addition to the rental of beach umbrella and sunbeds, have a swimming pool ideal for adults and children, entertainment service, baby changing rooms, sports fields for beach volleyball and beach tennis, fitness and relaxation area. There are also 3 hot tubs at Tinhare Beach. Prices are per person per day for a min. of 3 nights. Sleeping Breakfast + Wi-Fi + Heated + Breakfast until 11 am Euro 35 per person Child up to 10 years 50% discount Minimum stay 3 days. April 25 and May 1, we are waiting for you!